The song you hear is "A La Orilla de un Palmar (At The Edge of a Palm Grove”),” sung by Señorita Sarahi Velasquez. You’ll see her photo in the collage. Students at the San Francisco Bay Area's Los Cenzontles Cultural Arts Academy traveled recently with singer Linda Ronstadt to Banámichi, Sonora, Mexico, to meet with other teenage dancers from Grupo de Danza Xunutzi for a cultural exchange. Rosa Armida Contreras and Rafael Vindiola stood to the side of a portable wood dance surface plopped down in the town square, the two high school students shyly eyeing each other after being invited to join members of a visiting music and dance group that had traveled nearly 1,100 miles south from the San Francisco Bay Area. Contreras, Vindiola and more than a dozen other teens from Grupo de Danza Xunutzi folkloric dance troupe eventually shuffled forward to match dance moves with their U.S. guests, but only after Eugene Rodriguez, founder of the Northern California’s Los Cenzontles Cultural Arts Academy, reiterated his request. 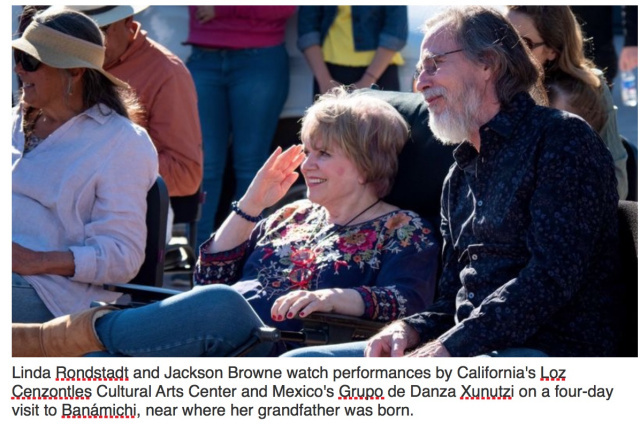 Among several dozen people of all ages looking on was singer Linda Ronstadt, a longtime cheerleader of the work Rodriguez and his collaborators have been doing for 30 years, teaching traditional Mexican music and dance to young people. Another member of that entourage, colloquially referred to as the Rolling Rio Sonora Revue, was another longtime friend of Ronstadt’s, singer-songwriter Jackson Browne. He’s one of several high-profile musicians who have worked closely with Los Cenzontles over the years. Others include Los Lobos singer, guitarist and songwriter David Hidalgo, blues musician Taj Mahal, Ireland’s the Chieftains and roots music guitarist and songwriter Ry Cooder. Browne and Rodriguez collaborated in 2017 on a bilingual song, “The Dreamer,” a tune that roughly documents the experience of one of Los Cenzontles’ maestras (teachers), Lucina Rodriguez. The latter came to the U.S. at 11 with her family — an experience echoed in the stories of many immigrants. On this trip, Browne would deliver a solo acoustic rendition of a song by Cuban singer-songwriter Carlos Varela, whose music Browne has championed in recent years. He performed “Muros Y Puertas,” which translates as “Walls and Doors,” a song that lobbies for unity over political and cultural division, and one possessing a message that echoed his raison d’etre for joining Ronstadt on the excursion. Enthusiasm eventually won out over apprehension among members of the group from Cecytes High School in Banámichi (bah-NAH-mee-chee), plus others from their companion group of alumni, Grupo Danza Masehua, paired up with Los Cenzontles’ boys and girls. Rodriguez and the Cenzontles band delivered a lively, thoroughly traditional rendition of the Mexican folk song “La Bamba,” which sounded nothing like the rocked-up Ritchie Valens and Los Lobos versions that spread the song’s popularity across the U.S. and around the world decades ago. Ronstadt had invited Rodriguez and the troupe to accompany her on a four-day visit to Banámichi, population 3,000. It’s near where her grandfather Federico José María Ronstadt was born and lived before migrating north in the early 1880s to Tucson. There, he became a U.S. citizen and established a dynastic Arizona family that, a couple of generations later, gave birth to the granddaughter who would become one of the defining voices of post-WWII popular music. “These girls are so beautiful,” Ronstadt, 72, said as she watched young women from the Banámichi group adjust their immaculately coiffed hair and dazzlingly colorful dresses before taking the stage. Ronstadt, who has long lived in the Bay Area, has championed Rodriguez and his students for a couple of decades. She’s also become an enthusiastic patron of the Xunutzi group since first watching a performance they gave in Tucson about a decade ago. It’s one way she can still express her lifelong passion for music. In 2013, she revealed that she had Parkinson’s Disease, which robbed her of her singing voice. She and cultural anthropologist Bill Steen, an old friend who also has family roots in Sonora, had wished for a while to bring Rodriguez and some Los Cenzontles students to Banámichi. They wanted to give the Californians an opportunity to meet and interact with the Xunutzi dancers, who consistently rank among the top Mexican high school folkloric groups in national competitions. An underlying goal of the trip: allowing young people from drastically different countries, backgrounds and life experiences to find common ground through music and dance. “We had a party after the performance on Saturday, and we all got to know each other,” said Sarahi Velazquez, 17, who sings, dances and plays the jawbone — a percussion instrument made from a real donkey jaw — with Los Cenzontles. At the previous day’s performance in Banámichi, Sarahi took the lead vocal on “A La Orilla de un Palmar,” which translates as “On the Edge of a Palm Grove,” dedicating it to Ronstadt, who smiled at the sight of a young Mexican American singer who looked and sounded not a little like herself more than half a century earlier. The song is a favorite in the Ronstadt family, which also was represented on the trip by her cousin singer-songwriter Bobby Ronstadt, and her nephew, Petie Ronstadt, another singer, songwriter, guitarist and banjo player. Lucina Rodriguez not only sings, dances and is part of the live band that accompanies the young dancers. She also is the center’s external education programming coordinator. More than that, she’s a virtual poster girl for the center’s fundamental mission of fostering understanding and building community through the arts. She and her family left their home in Jalisco and came to the U.S. illegally more than three decades ago. Like her parents, she applied for resident alien status as soon as she could and after a five-year waiting period, applied for and was granted U.S. citizenship. “What I like most about Cenzontles,” she said, “is that I can be myself. I can like pop music, but I can also go deep with the traditional music, which reaches much deeper than most pop music. And we get to work with these great artists. Where do the dreams go? Banámichi’s Plaza Hidalgo sits immediately in front of Hotel La Posada del Rio Sonora, where many of the travelers are staying. It’s immaculate after being not just swept but also mopped — by hand — each morning by town residents. Actor and filmmaker James Keach came along to get final shots he wanted for a documentary he’s making about Ronstadt’s life and career, one that’s slated to premiere in April at the Tribeca Film Festival in New York. Ronstadt persuaded Keach to oversee a companion documentary about Los Cenzontles’ 26-year relationship with the singer. Keach, whose 2014 documentary, “Glen Campbell: I’ll Be Me,” featured an Academy Award nominee for original song, stood one afternoon watching Banámichi children running, laughing and roller-skating around the gazebo at the center of the square, a few yards away from the town’s mission, La Iglesia de Nuestra Señora de Loreto (The Church of Our Lady of Loreto). “We are supposed to be making America safe from this?” he asked, shaking his head. This caravan from the north is welcomed by the residents and town officials, not least because of Ronstadt’s presence and family reputation. The performances bring out both Banámichi Mayor Alejandro Molina and recently elected Mayor Lucia Serrano of neighboring Arizpe, the site of the troupes’ second show, about 30 miles north via bus through rolling hills decorated with saguaro and organ pipe cactus, spiky ocotillo and agave plants and cottonwood trees lining the path of Rio Sonora. In fact, the meeting of the two youth music and dance groups is so momentous that when their Saturday afternoon performance in Banámichi hadn’t wrapped up by 5 p.m., Padre Julio Cesar agreed to postpone mass, allowing both groups to finish. Ronstadt remembers with great fondness growing up in Tucson, about 60 miles due north of the border town of Nogales. That confluence of cultures, which also includes a strong Basque element, also yielded much of the music Ronstadt grew up with as well as the distinctive dances exhibited by Los Cenzontles and Grupo de Danza Xunutzi — whose director, Nico Lazarraga, also makes most of their dazzling costumes, which Ronstadt’s contributions help pay for. Ronstadt also made this region’s music more popular — and sexier — starting in 1987 with a string of three hit Spanish-language albums. Many record executives predicted such an experiment would be career suicide for her when she released “Canciones de Mi Padre” (“Songs of My Father”) in 1987. Yet that album was so successful that she made two more: “Mas Canciones” (“More Songs”) and “Frenesi” (“Frenzy”), all three earning Grammy Awards and bringingLatin music to new generations as well as to rock and pop audiences that might not otherwise have listened. Ronstadt is a firm believer that the combination of music and dance creates something more than the sum of their parts. As for the German immigrants she cited, one of them was her great-grandfather. An engineer trained at the University of Hanover, Frederick Ronstadt was among droves of European immigrants who came to the new world in the 19th century. He traveled first to Argentina, then north to Mexico with the promise of a job as a mining engineer at the Santa Elena gold and silver mine just outside Banámichi. His son Federico, known simply as Fred after becoming a U.S. citizen, worked as a blacksmith and then began building buggies and forging other tools and equipment he sold to farmers and ranchers on both sides of the border, eventually expanding the business into what became Ronstadt Hardware, based in Tucson. Two of Fred’s sons, Gilbert (Linda’s father) and Edward (Bobby’s father), kept Ronstadt Hardware flourishing for nearly a century, until the arrival of national retailers such as Builder’s Emporium put many mom-and-pop operations out of business in the 1980s. Nevertheless, it’s still possible to find windmills with the Ronstadt name on them scattered here and there in southern Arizona and northern Mexico. Today, Banámichi feels like any number of idyllic small towns in the U.S., except that its residents speak Spanish. It’s not that there are no safety or security concerns here. One of the biggest challenges is the fallout from a 2014 toxic spill at the Buenavista del Cobre copper mine in Cananea, near the top of the Rio Sonora Valley. Those familiar with the area refer to the spill coming from the mine’s “tailings ponds,” a deceptive term for the extensive reservoirs where spent chemicals from the mining process are dumped. In fact, they look more like lakes. The Arizona Daily Star reported that 13 such “ponds” overflowed five years ago, carrying 11 million gallons of copper sulfate acid down the Banámichi and Sonora rivers all the way to the seaport city of Hermosillo, despoiling the Rio Sonora Valley’s primary source of drinking and irrigation water for the ranching and farming communities below. A month later, Hurricane Odile struck, washing much of the debris further down to collect around Hermosillo. There’s also the matter of drug cartels that operate in much of the country. The Rio Sonora Valley is under the purview of the notorious Sinaloa Cartel, but there’s no outward evidence of the kind of crime such cartels are caught up in elsewhere. This outing with Ronstadt isn’t the first significant field trip for Los Cenzontles. The troupe has traveled to and performed in Cuba, explored the intersections of traditional Mexican music and jazz in sessions with the Preservation Hall Jazz Band, both in that group’s home in New Orleans and in San Pablo at Los Cenzontles center. Rodriguez also was able to take almost a dozen youths to England and Ireland on the “San Patricio” tour with Cooder and the Chieftains. But the trek to Banámichi is the most expansive, with 21 members of Los Cenzontles, ranging from Sarahi Velazquez’s 8-year-old cousin, Ozvaldo Velazquez — the youngest of the Cenzontles travelers — to 23-year-old violinist-singer Nesta Velazquez. They’re supervised by Eugene Rodriguez, his wife, artesania and jewelry maker Marie-Astrid Do Rodriguez, and their son, bassist and audiovisual specialist Emiliano. The cost of bringing the students was underwritten by one of the academy’s Bay Area benefactors. Many Los Cenzontles students started at the facility when they were 4 or 5, a track record that’s evident in the confidence they exhibit in the dance steps and songs they’ve learned as well as their ease and enthusiasm performing in front of strangers. Nesta Velazquez is one of three members of his family who attend Los Cenzontles and joined the excursion to Banámichi. His 16-year-old brother, Gaizka, plays the guitarra de golpe and their 12-year-old sister, Claudia, plays the jarana huasteca. On this trip, along with comparing notes on music and dance with the Xunutzi troupe, they also get hands-on exposure to various aspects of the local culture: making gigantic tortillas during an afternoon lunch in the countryside about a mile outside of Banámichi, which like many towns here, derives its name from the languages of the Opata and Pima indigenous people who populated the region for thousands of years. The visitors also are exposed to local farming and cattle ranching practices and get to sample traditional Sonoran cooking: barbacoa, carne asada, chicharron (pork in red chile sauce), green chile tamales, rice pudding and ubiquitous beverages including jamaica and horchata. Since revealing her Parkinson’s diagnosis a half-dozen years ago, Ronstadt often says she “can’t sing a note” — not even at home in the relatively forgiving confines of her own shower. Its deleterious effect on muscle control, she has noted, is disastrous to the exacting demands on singers’ vocal cords. But this trip proves that there are certain songs, especially the old ones from this area she loves, that refuse to take her at her word. At lunch one day, her cousin Bobby and nephew Petie note that the song “A La Orilla de un Palmar” was a favorite of Fred Ronstadt, reputed within the family also to have been an accomplished guitarist. Ronstadt recorded a version that appeared on the 2010 album “San Patricio” that the Chieftains and Cooder made about the 19th century Irish immigrants who fought alongside Mexican soldiers in the Mexican American war. Linda sat in her chair on the sidelines, listening intently as Bobby and Petie’s voices locked in tight two-part harmony. Soon, however, a visitor seated next to her heard an angelic harmony gently gliding above the two male voices — an intimate encore from the voice that launched at least a thousand heartthrobs and heartaches decades ago. The next day, during a lunch break on the bus trip back to Tucson, between sips of caldo de queso soup at one of several plastic tables set up for guests next to a creek in the town of Bacoachi (bah-KWAH-chee), Ronstadt again quietly hums in exquisite harmony as Bobby and Petie sing “El Camino,” another traditional passed down through the family by Gilbert and Edward Ronstadt. “This is the latest iteration of this song,” Bobby said. Linda reminds a reporter seated next to her that she recorded her own version on “Mas Canciones” that also featured her brother Michael, who died in 2016, at 62, after battling liver cancer. Accompanying one of pop music’s biggest stars of the late 20th century isn’t lost on Eugene Rodriguez, who is quick to emphasize that his mission with Los Cenzontles has nothing to do with creating future stars like Linda Ronstadt, who has long insisted she was always more interested in singing than stardom. “The music industry is like a florist shop,” he said. “They select only the most beautiful flowers, cut them, package them and then sell them.